When someone in my family is sick, I make soup. You can pack a lot of nutrition into a single bowl without anyone knowing that you are trying to give them medicine. Here is one of my favorite recipes, which is full of powerful anti-inflammatory and anti-oxidant ingredients. 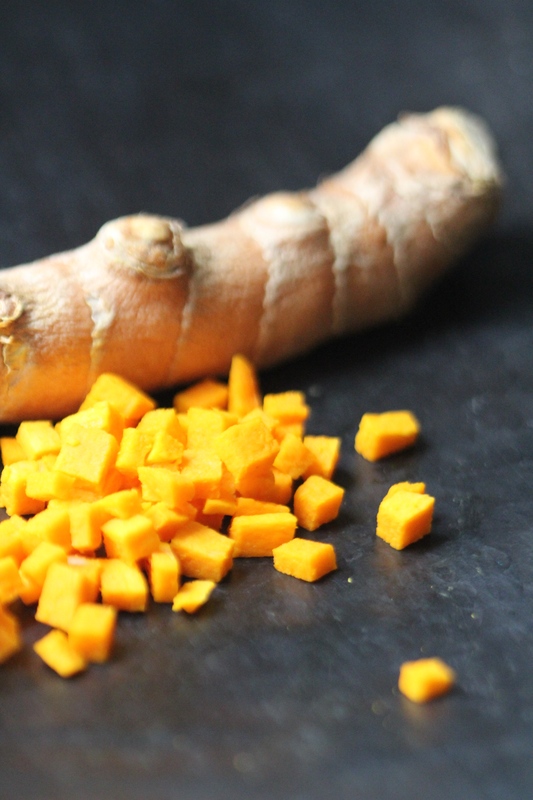 I generally make this recipe using dried turmeric, but it was equally delicious with the fresh. Saute the onion in butter until softened. Add ginger, turmeric, cumin, garlic, salt, and pepper and saute for 3 more minutes, stirring so that the garlic does not burn. Add squash pulp and broth. Simmer for 30 minutes. Allow to cool and then use a blender (immersion recommended) to puree until smooth. Add milk, if desired. Serve warm. And sprinkle with toppings. My favorites include pumpkin seeds and crumbled goat cheese. But you could add anything! Notes From Day 4/365 :: This daily five project is really opening my eyes to what little produce I eat consistently. A busy day can really make it a challenge to stay on track so I think I am going to begin EVERY day with a green smoothie. Do you have a favorite recipe? I’ll share mine tomorrow. Did you enjoy your daily five? What a great healthy soup!